Videos and Photos make everything viral on Facebook. You must have taken your own example of uploading your own photo or video which got more likes and shares. Same trick applies for your Business fan Pages to make them popular. To make any business page popular or successful, some tricky ways have to be applied. One of the main tricks that creates interest in your page visitors or viewers is "Video Contest". After considering these factors and making all points clear, the main part of creating the contest begins. Now below set the "Fan Gate" either as "On or Off" . To make your fans "Like" the page then set it "ON" either set as "OFF". Set the "Allowed content" and "Entry start and end date "
Below click on "Save Settings"
With all these settings, your "Video Contests" tab is created on your Fan page. The tab will be visible on your fan page. For using "Woobox" apps you need to pay to be the member of the site. There is another way for creating your Video contests for Facebook pages. 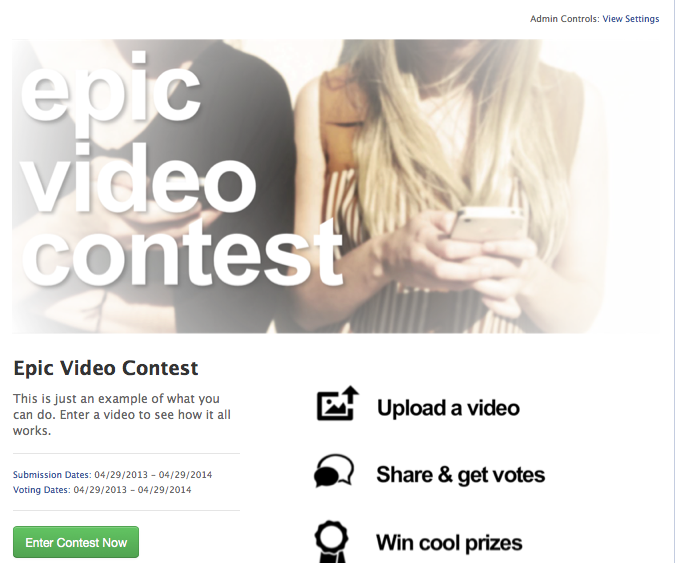 Another effective way to create is using "Video Contests " app by "Offer Pop" . The app will ask whether it is for "Facebook apps" or "Twitter apps"
The app will ask for permission. Click "Ok" and then will access your page. Click "Ok" here too. It will "Redirect"to your Page. * A credit card is required to activate your plan. This page has less than 101 fans, so you qualify for free access. Once your page reaches 100 fans, you will be prompted to purchase a subscription. You can cancel at any time, for any reason; your cancellation will be effective on the last day of the current billing cycle. If you provide with the details then the plan will be activated. It is a "video contest" that you are creating and for your business page promotion. Hence adding some more functionality by paying some money for activating the contest will boost your promotion technique.